Washington, Oct 10 US President Donald Trump has said he is considering three or four locations for his second summit with North Korean leader Kim Jong-un, and joked that he would no doubt like to visit the magnate's luxurious Mar-a-Lago club in Palm Beach, Florida. "It (the summit) is happening, we're setting that up right now," he told reporters on Tuesday in the Oval Office, Efe news reported. 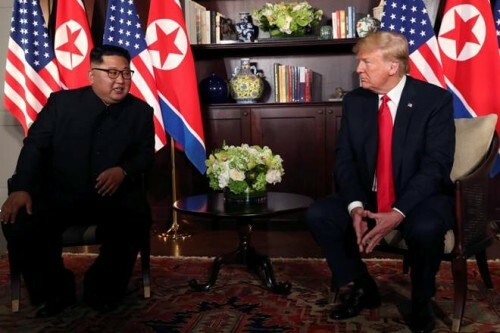 "We're talking about three or four different locations," said the President, who repeated that the summit is not likely to be held in Singapore, where the first meeting of the two leaders took place last June. Asked if Mar-a-Lago is an option, Trump smiled and said that Kim Jong-un would "probably like that. I'd like that, too. I think it would be good. But we'll see." At the start of his term in office, Trump invited Chinese President Xi Jinping and Japanese Prime Minister Shinzo Abe to Mar-a-Lago to show them part of his real estate empire while developing a personal relationship with them. However, Trump seemed to be joking about Mar-a-Lago this time, because convincing Kim to take a trip to Florida could be complicated, given that the White House couldn't convince him to come to Washington for their first summit. The President did not wish to specify whether any of the places under consideration are in the US, but predicted that as the distension process goes on, "eventually we're going to have lots of meetings on US soil and on their (North Korea's) soil by the way. That's a two-way street". US Secretary of State Mike Pompeo met Kim this Sunday in Pyongyang to prepare the second summit between Trump and the North Korean leader, and let it be known that this meeting will take place "as soon as possible." Pompeo said that significant progress has been made toward moving forward with denuclearization talks, but didn't wish to give any details at this time.